Administer the Structured Clinical Interview for the DSM-5 (SCID-5) online. 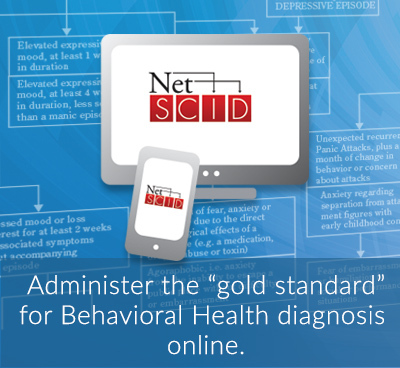 The NetSCID-5 is the first electronic version of the Structured Clinical Interview for DSM-5 (SCID-5) and is fully licensed by the American Psychiatric Association through American Psychiatric Association Publishing. It follows TeleSage’s successful development and implementation of the NetSCID-IV, which has been used in hundreds of research studies. Both were developed in consultation with the author of the SCID, Dr. Michael First, and were made possible by SBIR grants from the National Institute of Mental Health (NIMH USA). Improves the accuracy of diagnostic results. For more information, see the validation study below. Administer the interview that is right for you and your client. Select the relevant modules to administer. NetSCID-5 branches the user to the next appropriate question based on previous input. Progress is summarized on-screen. No special software is needed – only an up-to-date browser and internet connection. Administer via computer, laptop, tablet or smartphone. Data is kept secure and reliable on encrypted, geo-redundant servers. The entire system is fully HIPAA-compliant. The NetSCID-5 improves the accuracy of your diagnostic results. Please see the Validation section for more information. Electronic Health Record (EHR)-ready diagnostic reports are provided for each interview containing ICD codes and full diagnostic text, including specifiers. Administer the interview that is right for you and your participant/client. Users may click their way to the optimal interview by selecting only the modules they wish to administer. Patient and non-patient comprehensive interview options are also available. No more flipping pages back and forth to confirm that Criteria A, B, C, & D are coded “3”. The NetSCID-5 automatically prefills diagnosis items based on the relevant criteria results. The diagnosis items are still able to be changed at the clinician’s discretion. With the NetSCID-5, you can avoid the mental exercise of translating “If X questions were asked and full criteria were not met, then go to Y” and similar statements. The NetSCID-5 branches the user to the next appropriate question based on previous user input. In the paper version of the SCID-5, many questions contain text which accounts for every contingency. The NetSCID-5 omits multiple question text options and replaces them with the only applicable question text option based on previous input. No need for a notepad. Interview Notes provides a place for interviewers to write notes at any time during the interview, with no length constraint. For each individual question, interviewers also have the option to add open-ended Item Notes for event-specific information, justification for responses, questions/concerns, hypotheses, etc. The NetSCID-5 Advisor displays messages which are dependent on the responses to the previous screen’s questions. It confirms the rendering of diagnoses and specifiers, as well as displaying those which have been ruled out, providing the interviewer with instant feedback. The Diagnosis Tracker displays all confirmed diagnoses and specifiers during the current interview, and is easily accesible from every screen. A blue box indicates the current item selection, permitting the interviewer to use the arrow keys alone in selecting a response. This feature is particularly useful for quickly digitizing your old paper SCID responses into the NetSCID-5. The NetSCID-5 is also fully touchscreen compatible, so it can be administered using a tablet (such as an iPad) or smartphone. Each user is assigned a unique login and password that is assigned permissions based on Principal Investigator/Clinic Manager-approved roles. Up to three roles can be assigned per user: Interviewer, Report Viewer, Data Downloader. All data is stored using encrypted and geo-redundant servers, and the entire system is fully HIPAA-complaint. Need to review the response to a specific item? No problem. At the touch of a button, users can view/hide a summary box containing a tree-diagram of every question administered and their associated responses as well as each diagnosis met. Items presented in the summary box are active links that take the user directly to the item – enabling instant navigation both forwards and backwards within the interview! The NetSCID-5 makes it easy to pick up where you left off when an interview is cut short. You can also revisit completed interviews to correct errors. All administered items, responses, item notes, interview notes and item descriptions are are optionally displayed beneath the full report. This section includes the ability to resume the interview. No more data entry! Use your time for more fruitful analytic endeavors, such as identifying best practices, confirming study eligibility, establishing new or comorbid diagnoses, and engaging in other interesting and important analyses. Data can be accessed anytime with the Download Data feature, and is available in a horizontal tab-delimited set of text files which may be seamlessly imported into any spreadsheet or statistical analysis program (Excel, SPSS, SAS, R, etc). Access to data is hierarchically organized, with individual-, site-, project-, and organization-level permissions available. Our validation research included 24 clinicians who administered the SCID to 230 participants who completed the paper SCID and/or the NetSCID. Data-entry errors, branching errors, and clinician satisfaction were quantified. Ninety-seven (97%) percent of error rates occurred among clinicians administering the paper SCID; all errors that occurred when utilizing the NetSCID were subsequently corrected by our programmers. Administration time was reduced by over 30%. Clinicians found it easier to administer (p < 0.05), easier to navigate (p < 0.05), and simpler to score (p < 0.01). Ninety percent of clinicians preferred the NetSCID to its paper counterpart. – diagnostic errors were eliminated. – compared to the paper SCID, administration time was reduced by over 30%. – clinicians reported it to be much easier to use. Brodey, B. B., First, M., Linthicum, J., Haman, K., Sasiela, J. W., & Ayer, D. (2016). Validation of the NetSCID: an automated web-based adaptive version of the SCID. Comprehensive Psychiatry, 66, 67-70. Ashworth High Secure Hospital, Mersey Care NHS Trust; School of Psychology, University of Central Lancashire. A per-interview fee which covers all licensing and royalties to APA Publishing (who own the SCID-5 content), and an annual per-user fee which covers all data storage, hosting, and security, as well as comprehensive technical support. The per-user fee is $125 per year. We also offer discounts if your project will have >4 users. All prices are in US dollars, and we offer a variety of payment methods such as direct bank transfer, ACH transfer, credit card, and PayPal. Demo accounts to see the NetSCID-5 for yourself are available free of charge upon request. The NetSCID-5 RV (Research Version) is a comprehensive research-oriented 90-minute clinician-administered diagnostic assessment. The structured format of the SCID-5 with its direct adherence to DSM-5 criteria accounts for its strong test-re-test and inter-rater reliability and greatly improves the ability of researchers to accurately diagnose primary and comorbid mental disorders. The NetSCID-5 CV (Clinical Version) is heavily streamlined in content and in possible response options. Average interview length is only 30-45 minutes, roughly half the administration time of the Research Version. The Clinician Version retains the reliability and sensitivity of the Research Version in diagnosing mental health disorders. The NetSCID-5 Personality Disorders (PD) assesses the 10 DSM-5 Personality Disorders across Clusters A, B, and C as well as Other Specified Personality Disorder. Formerly known as the SCID II, it efficiently and accurately renders the most common diagnoses. The Screening Patient Questionnaire (SPQ) pre-populates the NetSCID-5 PD interview, further streamlining administration.